Breakfast for dinner is one of life's great pleasures. I'm not sure why the traditional morning meal becomes much more fun and a novelty at dinnertime, but it can't be denied. Usually we end up having breakfast for dinner when all that's left in the fridge are eggs and bread, although that was not the case this week when Baked Eggs with Bacon and Gruyere were on the menu! 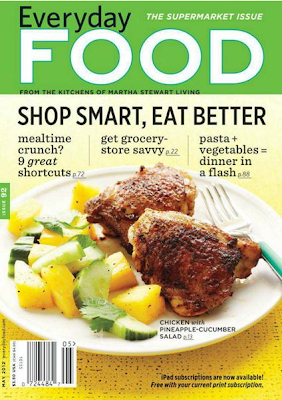 My recipe is adapted from the May 2012 issue of Everyday Food (issue 92). Originally called Emeril's Breakfast-In-Bed Baked Eggs and positioned as a Mother's Day recipe, mine were changed quite a bit due to ingredient preferences and a few mistakes! In a large bowl, sift together flour, 1 teaspoon of salt, and even less pepper. Add the eggs and just 1/4 cup of milk, whisking to combine with the flour mixture. Gradually add the remaining 1 cup of milk to the bowl, whisking to combine all the while until the batter is smooth. Take a rest for 30 minutes... Correction: Let the batter rest for 30 minutes! Now is a great time to dice your onion, shred the cheese, crumble and perform quality control on the bacon! If you haven't tried shredding in a food processor I demand that you stop whatever you're doing and try it rightNOW! It's stupidly simple and hassle free. In a skillet, melt some butter and cook onion until it's browned and delicious, about 10 minutes. Preheat the oven to 425 degrees F. Arrange breakfast vessels on a cookie sheet and assault them with non-stick cooking spray. Finally, combine cheese, bacon, and onion together, then separate them equally between the cocottes. This recipe actually makes 6 servings. Because my cocottes are quadruplets and not sextuplets (read: 4 not 6), I reserved some batter and cheese/onion/bacon to make two more the next day. Spoon the eggy batter on top equally. [This is when you should add chopped chives, but I forgot!] Bake for about 18 - 20 minutes until golden and puffy! Rather than staring at the oven for 18 - 20 minutes, make your desired side dish! I also used the food processor to shed some Idaho potatoes for hash browns. Not too pretty but very crispy! At dinnertime the sun is BLARING through my kitchen window, as such. I was probably cursing the glare and heat out said window when I realized the chives were never added! How cute are my homegrown chives and their striped home? How OCD is my neighbor's color coded laundry station?! Regardless, the chives go on top of the baked eggs! Putting them on halfway through made no difference. Be warned, the eggs only puff-up at the very last portion of their time in the oven. They're a perfect little breakfast in an individual cocotte! For freaks like me who prefer that foods don't touch each other, this is ideal! They're eggy, comforting, and deliciously cheesy. The savory bacon, browned and mild onion, and fresh chives add perfectly to the flavors. Between the time I started cooking and when they were finished, Bryce was beckoned to a restaurant in Waikiki with his boss so I enjoyed my dinner with Carrie, Miranda, Charlotte, and Samantha! This meal became my dinner twice and lunch twice this week and could still go back for more - if there were more! You can truly use any type of cheese or variety of socially accepted breakfast meats, get creative and remember that breakfast always tastes better for dinner!